LOS ANGELES - Image Entertainment, an RLJ Entertainment (NASDAQ: RLJE) brand, announces the DVD release of the popular musicals that make up the, Stephen Sondheim Collection . The compilation includes, Into the Woods, Company, "Sunday in the Park With George," Follies In Concert, Sweeney Todd, and Sondheim: The Birthday Concert. Directed by James Lapine, Lonny Price, Michael Houldey, and Terry Hughes, the various musicals star Bernadette Peters, Carol Burnett, Neil Patrick Harris, David Hyde Pierce, Jon Cryer, Stephen Colbert, Patti LuPone, Adolph Green, Anika Noni Rose, Audra McDonald, Barbara Bryne, Barbara Cook, Charles Kimbrough, Chip Zien, Christina Hendricks, Craig Bierko, Dana Ivey, Davis Gaines, Elaine Stritch, George Hearn, Joanna Gleason, John Aler, Liliane Montevecchi, Lisa Vroman, Liz Callaway, Mandy Patinkin, Martha Plimpton, Mary D'Arcy, Robert Westenberg, Stanford Olsen, Stephen Sondheim, Timothy Nolen, Tom Aldredge and Victoria Clark. 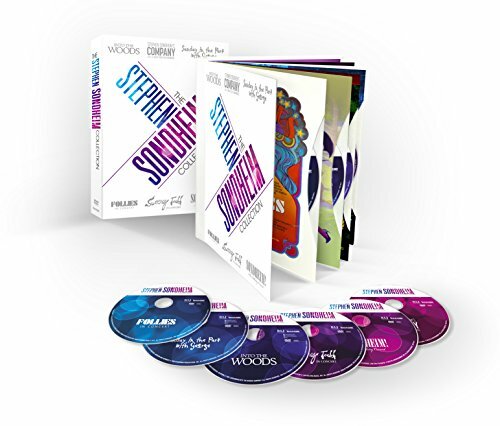 Stephen Sondheim Collection will be available on DVD for an SRP of $129.98 on Apr. 14, 2015. INTO THE WOODS (1990, NR, 153 Mins) � A baker and his wife journey into the woods in search of a cow, a red cape, a pair of golden slippers and some magic beans to lift a curse that has kept them childless. Tony Award winners Bernadette Peters, Joanna Gleason and the rest of the original Broadway cast weave their magic spell over you in Stephen Sondheim's masterpiece, directed by James Lapine, a seamless fusion of fairy tale characters and what happens after "happily ever after." With oft-recorded songs such as Children Will Listen and No One Is Alone, INTO THE WOODS is a music lover's delight from start to finish�and will forever cement Stephen Sondheim's unparalleled position as the giant of the American musical theater. COMPANY (2011, NR, 145 Mins) � Set firmly in, and often about, New York, follows five married, once married, or soon to be married couples and their mutual friend, Robert, a 35 year old bachelor who has been unable to connect in a long-term relationship. The relationships are presented in a series of vignettes, primarily through Bobby's eyes, so that we see the less than ideal aspects of commitment. However, it is obvious to the audience that the committed are happy. Eventually, Bobby learns that while relationships aren't perfect, they are a necessary part of "Being Alive." SUNDAY IN THE PARK WITH GEORGE (1986, NR, 147 Mins) � A Sunday Afternoon on the Island of La Grand Jatte by Georges Seurat is one of the great paintings of the world, book writer James Lapine and composer/lyricist Stephen Sondheim bring a story based on the work brilliantly to life. While the painting depicts people gathered on an island in the Seine, the musical goes beyond simply describing their lives. It is an exploration of art, of love, of commitment. Seurat connected dots to create images; Lapine and Sondheim use connection as the heart of all our relationships. FOLLIES IN CONCERT (1985, NR, 90 Mins) � The incomparable Stephen Sondheim brought his sensational Follies to the stage in 1971 where it was hailed as "monumental theater" by The New York Times. Fourteen years later, the magic was recreated by an unparalleled gathering of stage and screen luminaries performing with the New York Philharmonic at Lincoln Center for a wildly enthusiastic audience. This one-night-only performance became a legendary event in Broadway history! The evolution of this unique, historic event is exclusively captured in this film, from the first rehearsal�just four days before the show�to the last second butterflies just before the curtain rose. This is a rare treasure for all fans of musical theater. Includes the memorable songs Losing My Mind and I'm Still Here and an all-star cast! SWEENEY TODD (2001, NR, 132 Mins) � This delicious production, is a musical thriller of revenge and romance set in Victorian England, features Broadway diva Patti LuPone as Mrs. Lovett and veteran stage actor George Hearn in the title role. Premiering in 1979, the legendarySweeney Todd�winner of nine New York Drama Critics Circle Awards and eight Tony Award�is recorded with the San Francisco Symphony as conducted by Rob Fisher. SONDHEIM: THE BIRTHDAY (2010, NR, 116 Mins) � Join us for a rousing celebration of the life and work of one of Broadway's greatest legends � the one and only Stephen Sondheim. For the master composer and lyricist's 80th birthday, many of musical theater's brightest stars gathered to perform more than two dozen sensational numbers from Sondheim's illustrious career. Many of these enduring songs are rarely heard and several are performed by the original Broadway cast members. David Hyde Pierce hosts this magical event with Stephen Sondheim'o;s longtime collaborator Paul Gemignani conducting the New York Philharmonic. We would also appreciate inclusion in your DVD listings for Apr 14th, 2015. Via its relationship with Agatha Christie Limited, a company that RLJE owns 64% of, RLJE manages the intellectual property and publishing rights to some of the greatest works of mystery fiction, including stories of the iconic sleuths Miss Marple and Poirot. RLJE also owns all rights to the hit UK mystery series Foyle's War.